It’s our last day of survey as the Cefas Endeavour is due to dock in Lowestoft tomorrow. We’ve been kept busy at Holderness Offshore rMCZ, grabbing, sieving and using the drop camera, with sampling stations often only 20 minutes apart. Yesterday, the day shift got a brief glimpse of a Pilot Whale, recognisable from its distinct fin, but there was no time to take a photo. We also encountered several gas platforms at Holderness Offshore and while maintaining the mandatory distance from the platforms there was still an opportunity to take some pictures through the mist and fog. To finish up here’s a collection of images from Swallow Sands and Holderness Offshore rMCZs. It appears Swallow Sand is indeed aptly named. Not only have we found lots of sand, but several swallows have appeared on the ship. They like to fly into the general lab where we watch the footage from the camera sledge. It started with one or two then last night there were 13 swallows huddling together outside the bridge. Yesterday we had a fire drill. Everyone had to drop everything and go straight to the muster station. There was a roll call to ensure nobody was missing before two of the crew donned fire suits before proceeding to the SIC’s (Scientist in charge) cabin where the fire had started. Needless to say this was only a drill so there was no actual fire. Scientists were ask to help the crew close vents to cut off the air supply to the area affected and check for hotspots. At the end the scientists were shown how to operate the fire hoses. Today we had our first sighting of dolphins. Unfortunately I missed it as I was fast asleep but Nathan who is on the night shift was kind enough to donate some of his photos of the white beaked dolphins to the blog. We’re still out at Swallow Sand with plans to move off in the next day or two to Holderness Offshore recommended Marine Conservation Zone (rMCZ). We left Berwickshire and North Numberland SAC and arrived at Swallow Sand rMCZ late on Wednesday night following an 8 hour transit. Like Fulmar rMCZ, it is not possible to map all of Swallow Sand in the time available due to its huge size (~ 4,000km2). Multibeam bathymetry and backscatter data are collected on transit between the survey stations. The day and night shifts are settling into a routine now collecting grabs at every station and completing camera tows at every third or fourth station. 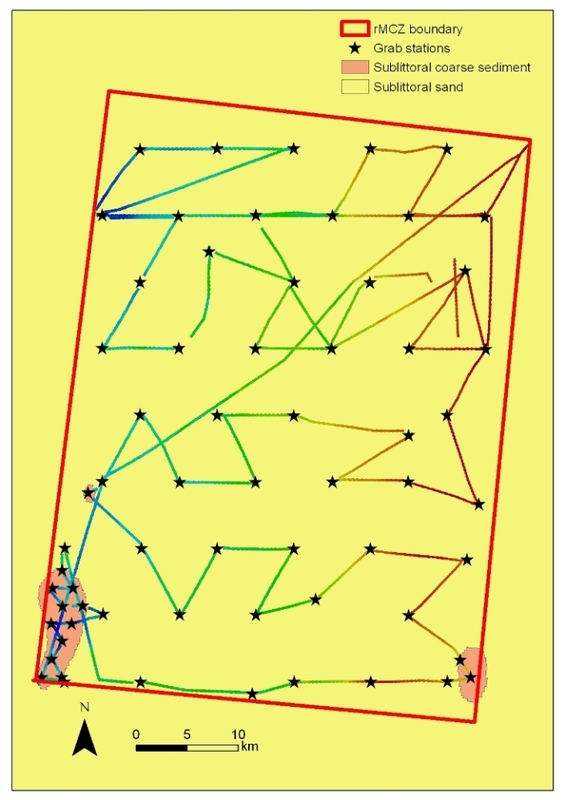 The transit between stations takes roughly 40 minutes as we map the route between sampling stations. Fulmar rMCZ was visited on the first part of this survey. At just over 2,000km2 it’s half the size of Swallow Sand. 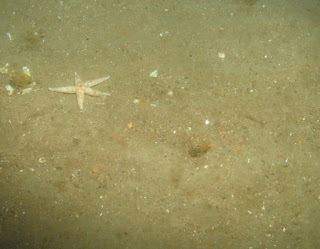 Fulmar is being recommended as an MCZ for its subtidal coarse sediments and sands and the Ocean quahog (Artica Islandica) (see pg 535 for more information). Sixty- five Hamon grab sediment samples were taken and the camera sledge was used to take video and still images at 25 of those stations. Artica Islandica was found in several grab samples (see image below). It’s important to celebrate the important events at sea and on Wednesday we did just that with balloons, banners and cake for Ruth’s 30th Birthday. 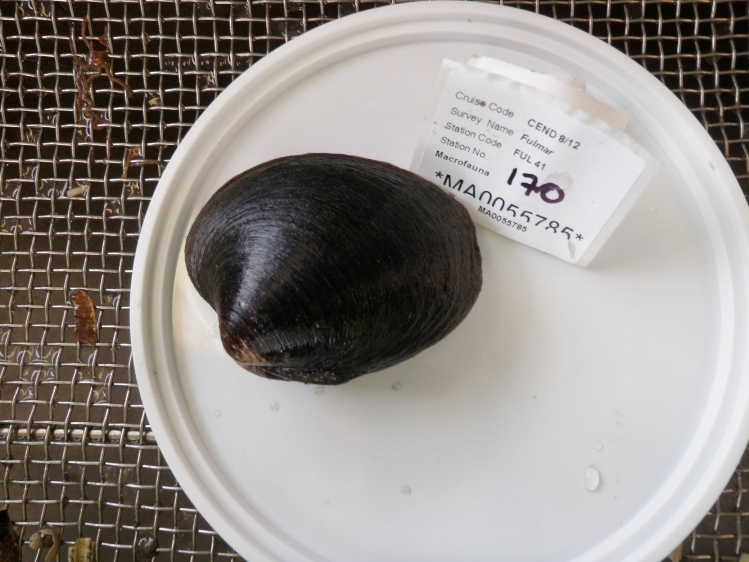 Hello and welcome back to the JNCC marine survey blog. We joined the Cefas Endeavour at the Tees North Sea supply base in Middlesborough on Saturday 12th May and set sail early on Sunday morning. 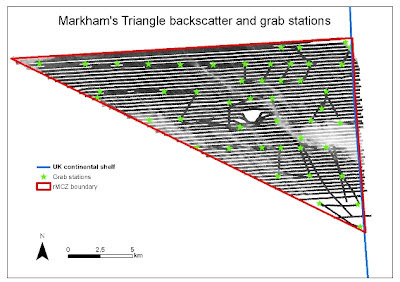 Our Cefas colleagues have been hard at work for the last two weeks gathering multibeam, grab and video data for Markham’s Triangle and Fulmar recommended Marine Conservation Zones (rMCZs). 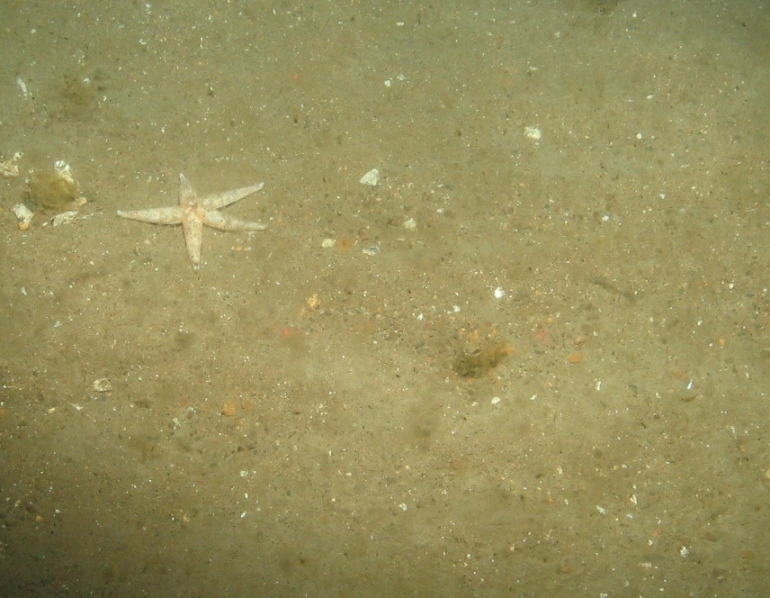 On this part of the survey we will be collecting multibeam and video data in Berwickshire and North Northumberland Coast Special Area of Conservation SAC (BNNC SAC) and multibeam, video and sediment grab data in Swallow Sand and Holderness Offshore rMCZs. 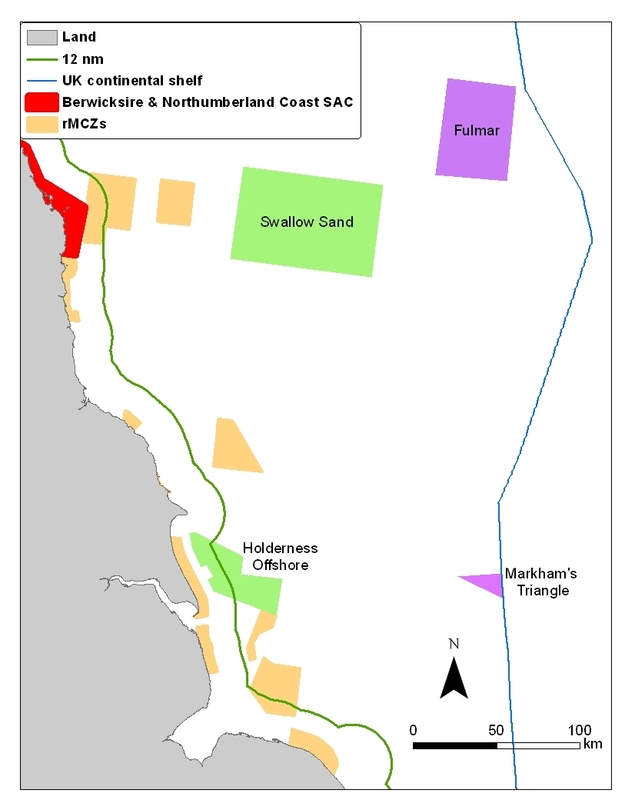 The map below shows the rMCZs and Berwickshire and Northumberland Coast SAC. 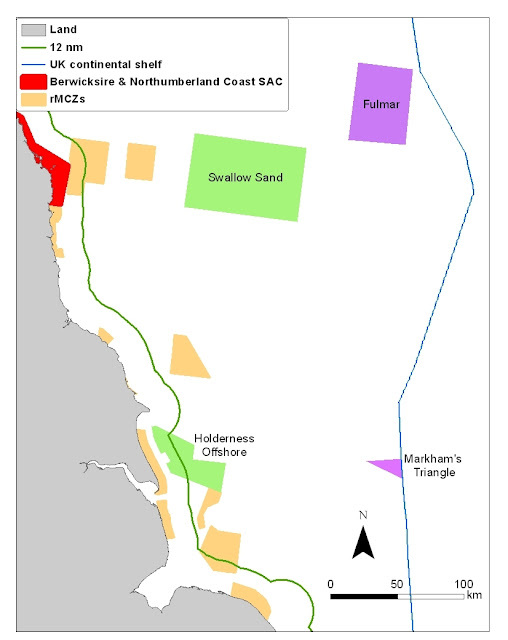 The rMCZs which were surveyed during the first part of the survey are in purple and the rMCZs to be surveyed on this part of the survey are in green. As the forecast was predicting gale force winds when we left the Tees, we headed straight to BNCC SAC, the closest site to shore, to avoid the worst of the weather. We arrived around 3pm and conducted a CTD before starting detailed mapping of two areas, Holy Island and Farne Islands. Both areas have now been groundtruthed with video and still images and we’re now mapping a third area called Dunstanburg. For this first blog, we’ll show some of the results from Markham’s Triangle rMCZ (see pg 230 for more information). It has been recommended as an MCZ for its subtidal coarse sediment and subtidal sands and covers an area of around 200km2. The multibeam survey was designed to give approximately 75% coverage of the site. Multibeam data provides both water depths and backscatter data which gives an indication of the substrate type. 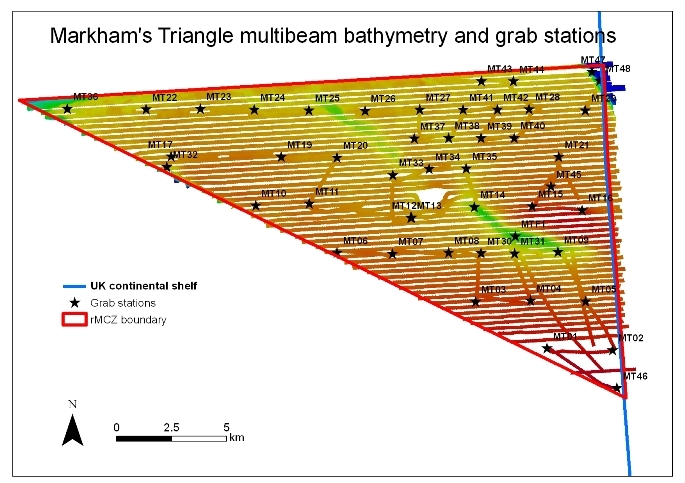 The strange gap in the multibeam data is due to the Chiswick Field Well which was situated in the middle of some of the survey lines. Sediment grabs were taken at 50 stations to ground-truth the multibeam data. Video and still imagery were also collected with the drop camera from 22 stations.